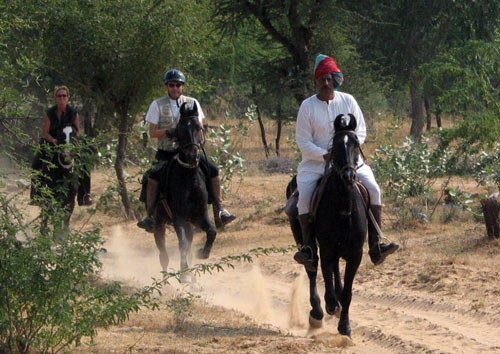 If you have been riding horses, you know the classic, walk, trot, canter and gallop. 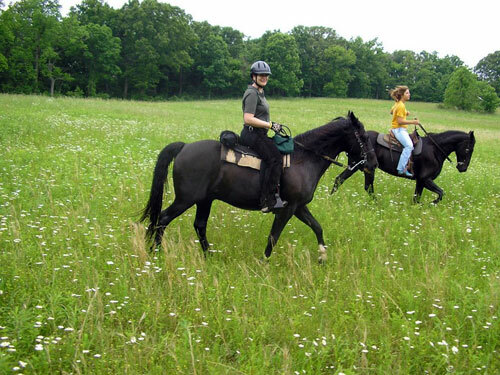 However today, ambling or gaited horses are popular amongst casual riders who seek soft-gaited, comfortable horses for pleasure riding: Below we will give you some more detailed information about the gaits that are used on some of our Hidden Trails Horseback Riding vacations. Please keep in mind that gaited horses are best suited for open and fairly even terrain. You will not see the benefits of a gaited horse on mountain trails. You will also not be doing much cantering and galloping (that would defeat the purpose), but some of the gaited horses can keep up with a horse cantering at their specific gait. All horses move naturally with four basic gaits: the four-beat walk, which averages 6.4 kilometers per hour (4.0 mph); the two-beat trot or jog, which averages 13 to 19 kilometers per hour (8.1 to 12 mph)); and the leaping gaits known as the canter or lope a three-beat gait that is 19 to 24 kilometers per hour (12 to 15 mph), and the gallop a four beat movement which averages 40 to 48 kilometers per hour (25 to 30 mph). These gaits can be found on most of our Hidden Trails equestrian trips. Besides these basic gaits, some horses perform a two-beat pace, instead of the trot. In addition, there are several four-beat "ambling" gaits that are approximately the speed of a trot or pace, though smoother to ride. These include the lateral slow gait, rack, running walk, and tölt as well as the diagonal fox trot. 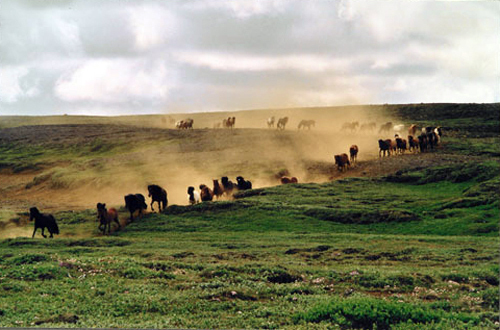 Ambling gaits are often genetic traits in specific breeds, known collectively as gaited horses. In most cases, gaited horses replace the standard trot with one of the ambling gaits. The paso fino, paso corto, and paso largo are smooth innate intermediate gaits of the Peruvian Paso and Paso Fino. 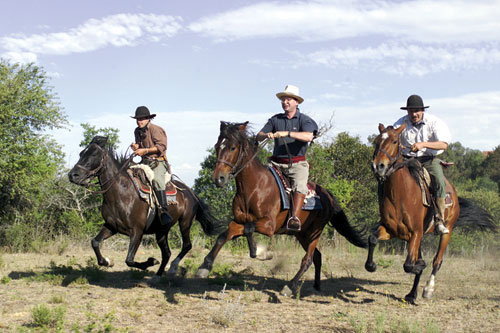 The Paso Fino has several speed variations called (from slowest to fastest) the paso fino, paso corto, and paso largo. All have an even 1-2-3-4 rhythm. The Paso fino gait is very slow, performed mainly for horse show competition. Horses are ridden over a "fino strip", which is usually plywood set into the ground, so the judges can listen for absolute regularity of footfall. 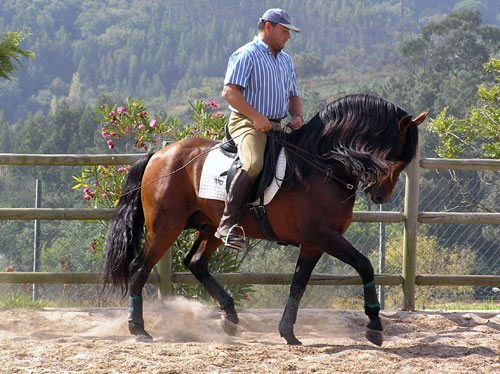 The paso corto is similar to the single-foot. The paso largo is similar to the rack and can be extremely fast, up to 25-30 mph. The fox trot (no we are not talking “dancing with the stars”) this gait is most often associated with the Missouri Fox trotter breed, but is also seen under different names. The fox trot is a four-beat diagonal gait in which the front foot of the diagonal pair lands before the hind, eliminating the moment of suspension and giving a "no bounce" ride said to also be sure-footed. While the gait is sometimes described as having the horse walk with the front feet and trot with the back, this is not correct, it is a broken diagonal gait with a footfall sequence of "right hind, (right front, left hind), left front" with the diagonal pair being closer in timing. The fox trot is a comfortable gait for trail riding and easy on the horse. The rack is a natural ambling four-beat gait (single foot or rack) with no evidence of pacing. When the horse moves you can count four distinct hoof beats which produce a cadence of equal rhythm, just like a walk: left hind, left fore, right hind, right fore. The American Saddlebred and the Rocky Mountain Horses are a good example of horses with this gait. Our Hidden Trails trips in Spain, Ecuador and Portugal have Andalusian and Lusitano horses which technically are not special gaited horses but they have great balance, and are have a very comfortable gait.